Money-saving combo includes a gallon and a full 32 oz.! Marine 31 Gel Coat Wash & Wax with Carnauba is a high-sudsing, biodegradable shampoo that gently removes dirt, grime and soiling on your boat while leaving a protective layer of real carnauba wax. Formulated to be tough on grime and safe for the environment, Marine 31 Gel Coat Wash & Wax with Carnauba gently cleans all gel coat surfaces while imparting a high-gloss, slick carnauba finish. Washing a boat is not as easy as washing a car which is why Captain Max - avid boating enthusiast and the man behind Marine 31 - said let�s make it easy by incorporating real carnauba wax into a high-sudsing, easy-rinsing, environmentally-friendly boat wash. Marine 31 Gel Coat Wash & Wax with Carnauba was born and it exceeds all expectations set forth by Captain Max. Marine 31 Gel Coat Wash & Wax with Carnauba is perfect for the boating enthusiast that would prefer to spend more time piloting their boat than maintaining it. 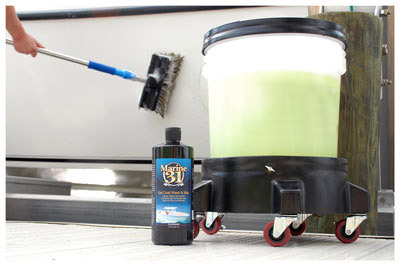 By combining a synthetic detergent formula that features advanced biodegradable surfactants and real carnauba wax, Marine 31 Gel Coat Wash & Wax with Carnauba cleans, shines and protects your boat in one simple step, enabling you to spend more time out on the open water and less time performing laborious cleaning tasks. Marine 31 Gel Coat Wash & Wax with Carnauba is the solution to protect your boat against UV-induced fading and discoloration. Just by regularly washing your boat with Marine 31 Gel Coat Wash & Wax with Carnauba, you keep the gel coat protected with advanced UV inhibitors and real carnauba wax. It�s that simple! 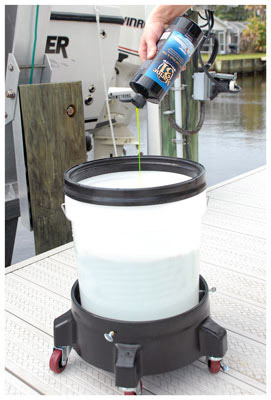 What�s more, Marine 31 Gel Coat Wash & Wax with Carnauba is harbor safe, biodegradable and VOC compliant. Tip from Captain Max: Few things make me happier than a clean, shiny boat. I�ve found that no other brush gets my boat cleaner faster than the Montana Original Boar�s Hair Wash Brush PLUS. This large brush is constructed of 100% boar�s hair bristles that safely lift, trap and wash dirt away from the surface. Add the telescopic handle for even easier washing. After I wash my boat I follow with a quick coat of Marine 31 Gel Coat Spray Wax Plus to further protect the finish against salt and UV rays. The added gloss and slickness is a bonus too! Add 1 ounce of shampoo into a bucket containing 3 gallons of water. For heavily soiled surfaces, added 2 ounces of shampoo per 3 gallons of water. Activate foam by spraying a strong jet of water into the wash bucket. Working one section at a time, wash the surface using a high-quality wash mitt or boar�s hair wash brush. Continually rinse surface to avoid water spots. Once entire boat is cleaned, towel dry using a high quality microfiber drying towel, like the Supreme Guzzler Waffle Weave Drying Towel. Includes 128 oz. and 32 oz.